Florida AD Scott Stricklin went to New Hampshire on Sunday, but he didn’t bring Chip Kelly back with him. Published on Sunday, 11/19/17, at 10:55 p.m. Eastern. GatorBait.net reported that six of Florida’s top officials flew to New Hampshire on Sunday to have a formal meeting with former Oregon coach Chip Kelly. Football Scoop and the Gainesville Sun confirmed these reports. Robbie Andreu, the Sun’s UF football beat writer since 1993, confirmed reports that UF reps flew to New Hampshire and came back to the Sunshine State without Kelly, who wants to meet with UCLA before making any decision about his future. UPDATE: UF and Kelly both knew this was a formal meeting, but not one in which a job offer would be presented or Kelly would accept. In fact, Kelly has made it known he won’t be signing with anyone until this Sunday (11/26) because if he did, he wouldn’t qualify for a $5 million payment from the San Francisco 49ers. An SB Nation report earlier today indicated Kelly was interested in multiple jobs on the West Coast. When UCLA fired Jim Mora Jr. earlier today, things started moving fast for Florida, UCLA and Kelly. SB Nation also reported that UF has spoken with representatives for both USF’s Charlie Strong and UCF’s Scott Frost. The plane with UF officials landed in Portsmouth, N.H., at 4:21 p.m. Eastern and left at 7:45. When the plane arrived in Ocala, Florida AD Scott Stricklin spoke briefly with a small pool of reporters. 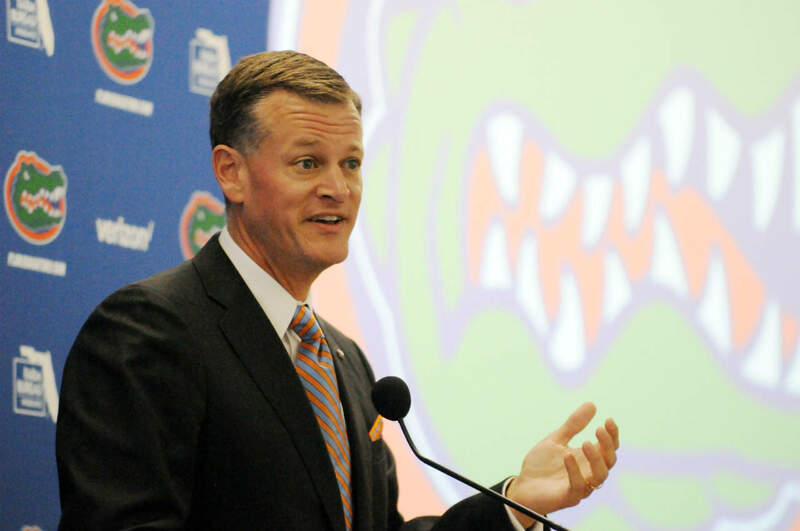 Stricklin told SECCountry.com, “we continue to have productive conversations.” He wouldn’t confirm or deny that the Florida brass met with Kelly. According to SECCountry.com, UF’s traveling party included Stricklin, President Kent Fuchs, executive associate AD for external affairs Mike Hill, executive associate AD for internal affairs Laird Veatch, executive associate AD for administration Lynda Tealer and senior associate AD for communications Steve McClain. A source for BrianEdwardsSports.com who wished to remain anonymous says Mike Gundy covets the Florida job and would jump from Oklahoma St. if he received an offer. Gundy also pushed for the UF job in 2014. I believe Gundy is the best fit for the Gators. Is Kelly really the right guy for Florida? There certainly have to be concerns about his preference for the NFL, though he won’t get an NFL head-coaching job offer for several years. But what if that changes after a few elite seasons in Gainesville? What about his reported preference for the West coast? And there’s the 18-month show-cause he was issued from his tenure at Oregon. Remember, Florida hasn’t been on probation in more than a quarter-century. Clay Travis of OutkickTheCoverage.com reported Sunday that momentum between FSU’s Jimbo Fisher and Texas A&M was building. There’s a matter of an enormous buyout, however, but A&M does have as much cash as any school out there. UPDATE: FSU is only owed a buyout payment in the $8 million neighborhood from Fisher or another school hiring him. The enormous buyout payment you may have seen reported or tweeted in the $40 million range is only what Fisher would get paid if FSU chose to fire him before his contract ended. Oregon’s Willie Taggart is getting interest from multiple SEC schools, including Ole Miss. Knoxville sports radio personality Tony Basilio said on my Games Galore 24 podcast this past week that Taggart is “a fish out of water out in Oregon.” Taggart is from Bradenton, Florida, and had successful tenures at Western Kentucky and USF before leaving for the Oregon job last year. If the Oregon job opens up, would Frost prefer that gig over Nebraska, his alma mater, or Florida? Mississippi St.’s Dan Mullen garnered interest from the Ducks last year and is believed to be a potential candidate at Tennessee, Texas A&M and maybe even Auburn. SB Nation reported Sunday that Gus Malzahn is interested in the Arkansas job and could play a role in the selection of the school’s next AD if he takes the job. This potential move probably hinges on the result of Saturday’s Iron Bowl. Memphis second-year coach Mike Norvell may get interest from the Razorbacks if their top choice Malzahn doesn’t work out. SB Nation also suggested that if Malzahn left Auburn, the school would probably join Texas A&M in making a strong push to hire FSU’s Fisher. Current Oregon assistant, former FIU head coach and former Alabama assistant Mario Cristobal would be a likely candidate for the USF and/or UCF jobs if either becomes vacant. SB Nation also reported that Navy’s Ken Nuimatalolo might get interest from Nebraska if it can’t land Frost. He could also be in play at Oregon St., which has reached out to former Florida coach Jim McElwain and former Tennessee coach Butch Jones. The Beavers parted way with Gary Anderson a month ago.